Since it’s an October and officially a pumpkin season I’ve got a few more pumpkin recipes coming for you. 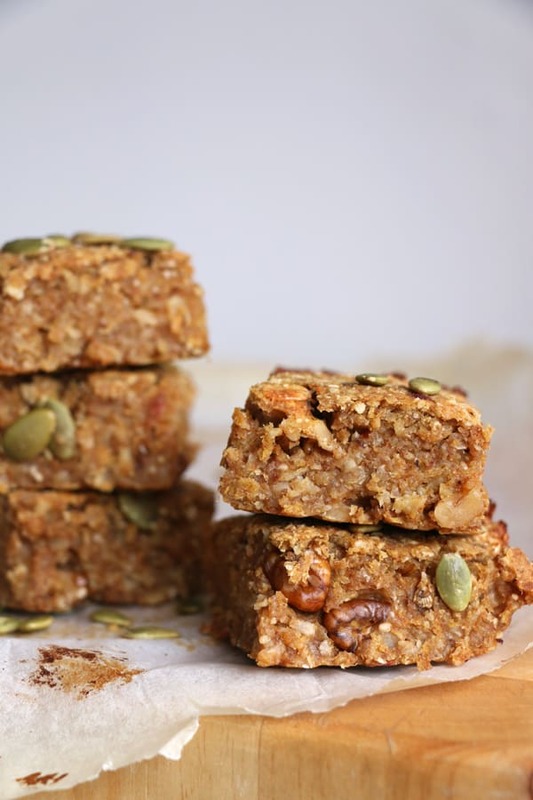 Last week I’ve been playing around with healthy breakfast ideas and have created this moist Pumpkin and Oat Breakfast Bars recipe. 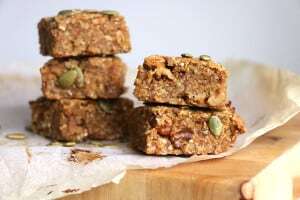 They are really delicious bars made with fresh pumpkin, sweetened with few medjool dates and beautifully spiced with cinnamon, cardamom, ginger and cloves. I’ve used fresh pumpkin that I’ve made into a puree, but I suppose you could use ready made one if you prefer. You could also use different nuts like pecans that are traditionally teamed up with pumpkin. The bars will be moist due to the amount of pumpkin, so I recommend to store leftovers in a fridge. To make the pumpkin puree, peel the pumpkin, remove the seeds and chop into wedges. Place into a pot with water, bring to a boil and simmer for about 20 min until soft. Drain, leave to cool down and blend into a puree. If you prefer you can roast pumpkin instead. Line 9" square baking dish with large piece of baking paper. 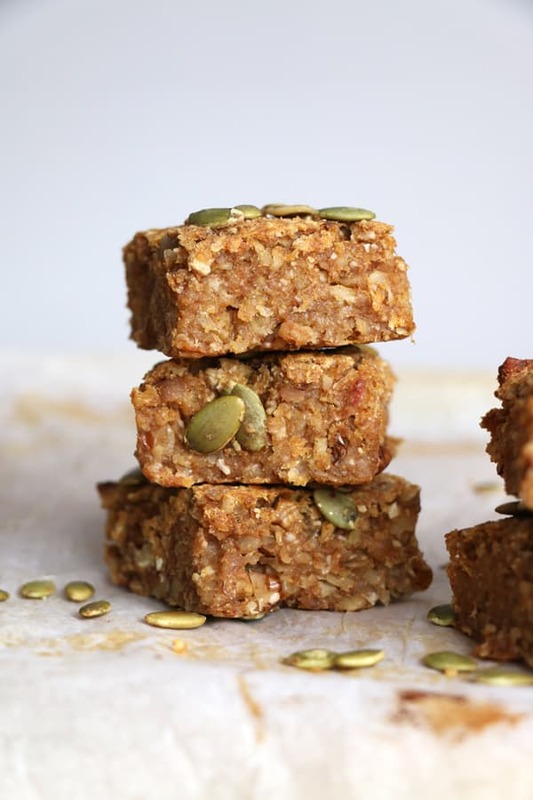 Blend 2 cups of pumpkin puree with medjool dates and coconut oil and set aside. 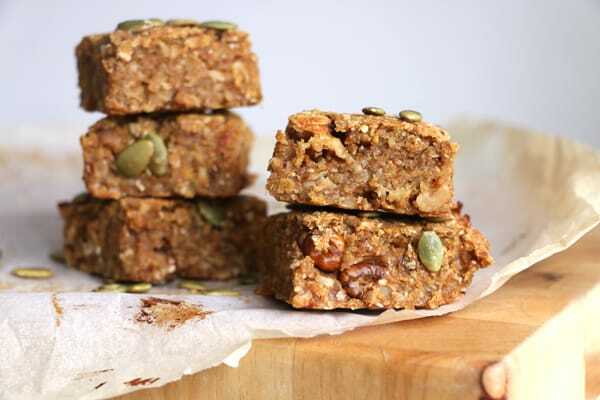 In a large bowl whisk together oats, coconut, baking powder, cinnamon, cardamom, ginger, cloves and salt. Add pumpkin mix and chopped walnuts and mix well together. Spoon the mixture into prepared dish, sprinkle with pumpkin seeds and bake for about 30-40 min until browned around the edges. I didn’t have pumpkin to make the puree so I mashed up 4 bananas but still used the pumpkin spice. They are still amazing. Thank you for a great recipe! Hello! Made these lovely bars this afternoon and they are amazing! I added a bit of brown sugar as well, as I wanted something for my sweet cravings ;) They are just perfect, ate two pieces straight away when they came out of oven. Thank you for the recipe! lol At least I can laugh because finding this recipe is a happy experience that will support better health! : ) Thank you so much! I might even brave the cauliflower brownie recipe. 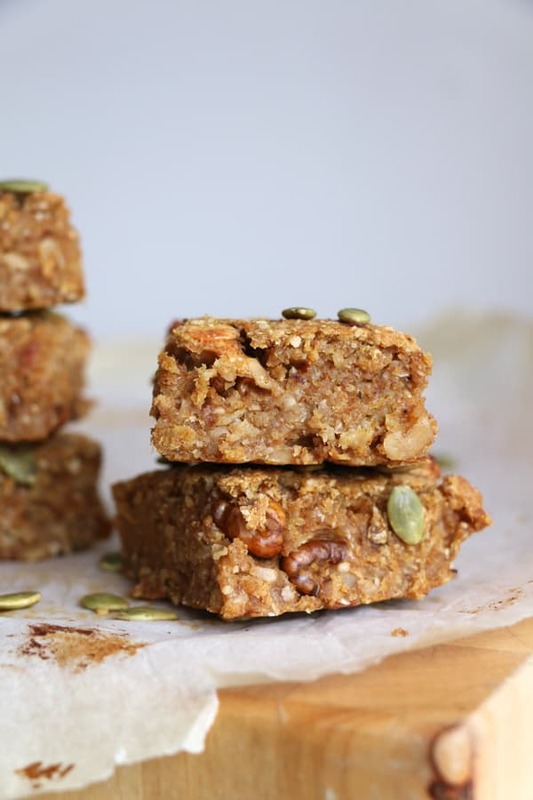 These are only gluten free if the oats are processed in a gluten free environment. Make sure it says gluten free on the package . Hi Karen, thank you for your comment. Yes, unfortunately some people can’t tolerate oats even if they’re gluten-free ones. I have recently moved onto eating quinoa flakes instead of oats myself, but still have them occasionally as a treat. Would you know the nutrition information for these?